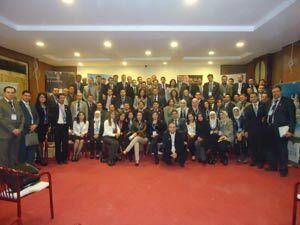 Ibn Al Haytham pharma held its sixth annual conference outside the country in the city of Gaziantep –Turkey over three days . It included a lot of activities and events . The essential meeting was held on the first day in which the total sales were reviewed then the sales and the achievements of each region separately . Thereafter , a review of the most important activities of marketing department . The first day events were concluded with the awards and material rewards for those representatives who have achieved the goal of selling and to some colleagues who worked behind the scenes . It's worth mentioning in particular the vital elements that work to manufacture the drug at Ibn Al Haytham factory like Dr. Mahmoud Abu Abed , Dr. Ayman Kelzeyeh and his wife Batoul . The events were completed on the second day with a range of scientific activities that were arranged by the marketing office in addition to some games that motivate team spirit. The recreational period was an important share of the conference program where the participants enjoyed a dinner over two days on the melodies of the beautiful Turkish art. Shopping had a good share during a tour of the participants in the city of Gaziantep. Finally, on the third day on the way back to beloved Syria , Ibn Al Haytham pharma team visited a zoo in Gaziantep city which is known as the largest one in the middle east . It's worth mentioning that Ibn Al Haytham pharma always motivates social activities to enhance the relations among its members which positively will reflect on the overall achievement of the company.